Are you looking to master web hacking? Interested in a bug-hunting career? Do you want to land a job in cybersecurity? Last week, we sat with the ZDResearch training team and asked them a few questions to learn more about their "Advanced Web Hacking" course and understand how it could be a better choice for you. Can you tell us a little about ZDResearch? ZDResearch is a cybersecurity firm with more than 6 years of experience, having some of the world's top hackers and security researchers committed to engineering engaging and approachable courses to the most technical of topics. In the ZDResearch Advanced Web Hacking Course, the greenhorn, the novice, or the pro will benefit. Those selected to work for ZDResearch, and its department dedicated to student learning (ZDResearch Training), have disclosed dozens of zero-day vulnerabilities to Facebook, Google, Intel, Telegram, and countless other tech giants, themselves staffed with the best and the brightest. What advantages does "Advanced Web Hacking" have over other trainings? The ZDResearch Advanced Web Hacking training takes advantage of both novel and traditional instructional principles on some of the most complicated hacking techniques to create excellent, second-to-none training materials in tandem with a user-friendly, integrated learning experience. ZDResearch used a revolutionary approach to learning back-end hacking taught by top-notch instructors (who recently won US national cybersecurity competition in Orlando, Florida) have developed course content and curricula under the tech company and course name ZDResearch Advanced Web Hacking, respectively. In a highly competitive industry with spectacular talent and smarts, the ZDResearch Advanced Web Hacking course has been an in-demand course for 5 years and counting. To be more specific, ZDResearch Training teaches real-world, hands-on hacking scenarios, which is rare to find in many firms without effective offensive security experience. Advanced Web Hacking bundles this real-world, hands-on experience with detailed labs and assignments that help the student master the subject matter in the shortest amount of time. Will this course undergo updates in the future? Just like dog years, tech years don't work the same as human years. Tech years move quickly, and technology advances exponentially. The ZDResearch Advanced Web Hacking course has not only kept pace with instruction on current technologies but has proven itself a sharp and capable competitor by anticipating future instructional needs on bleeding edge technologies. Quality survives in the tech industry, and ZDResearch has not only survived: it has thrived. 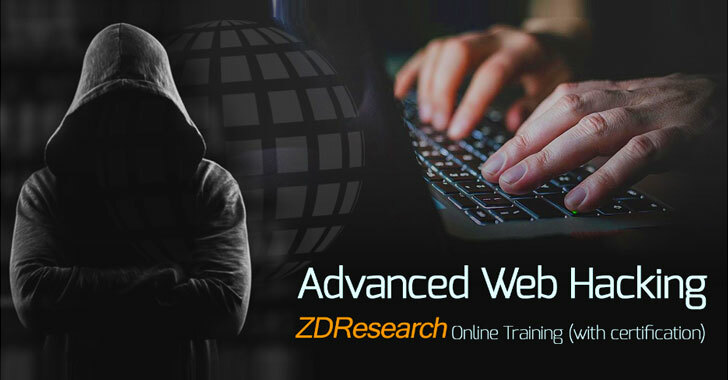 The development of the ZDResearch Advanced Web Hacking course, and its opportunity for certification upon successful completion of the course and passage of the certification exam if applicable is just another example of how ZDResearch has had the foresight regarding trends in the industry with learning. It has used its team to innovate and fill a niche in the market that has no other high-quality alternatives. Is the course made of only video lectures or does it have practical materials? ZDResearch Training is prepared to rapidly respond to any and all questions students have in order to provide a seamless, integrated, and effective learning experience. No question is too simple, and no question is too complex. To think like a hacker you must engage in parallel processing—in the ZDResearch Advanced Web Hacking course, students will grasp the broad strokes, conceptual aspects of hacking in addition to the nitty-gritty particulars and details. To top all of that, Advanced Web Hacking materials are entirely downloadable. That includes assignments, lectures, supporting materials, virtual labs, etc. Can former students access updates? The structure engineered by, and for the ZDResearch Advanced Web Hacking course offers fully-automated online training. Students are thus able to work at their own respective paces to master core hacking skills. Upcoming web application security challenges, attacks, and topics are regularly added to the course as a result of collaboration ZDResearch's team: only skilled hackers could have the insight and foresight to make a course addressing the present and the future. As a bonus, former students retain lifetime access to these materials. Do you provide Certificates for students who complete the course? At the conclusion of the ZDResearch Advanced Web Hacking course, a rigorous examination provides students with both a physical and virtual ZDResearch Advanced Web Hacker (ZAWH) certification given a passing grade on their exams. The platform on which the training is hosted (Exdemy), also provides certificates of completion for students who complete the course materials. Of course! ZDResearch Training has collaborated with the #1 source for serious, technically-oriented hacking news at TheHackerNews.com to offer its dedicated readers 50 coupons eligible for application to a $400 discount for the ZDResearch Advanced Web Hacking course. What is Included in the "Advanced Web Hacker" Course? Though the people at ZDResearch look for workarounds, there are no secrets or tricks to achieve a high-quality, seamless instructional experience. Advanced SQL Injection: From writing custom Double-Blind injection scripts to Second Order injections and Order-By injection clauses resulting in full system takeover, Advanced SQL Injection will cover all the necessary skills for mastering SQLI. Command Injection: With command injection, students will be involved in creating Reverse Shells and Bind Shells which are able to bypass both file type and filename filters. For completeness, in the ZDResearch Advanced Web Hacking Course other command injection methods are covered as well. Code Injection: Going beyond the typical eval injection, code injection in "Advanced Web Hacking" covers file inclusions (LFI/RFI) and regular expression injections in addition to other types of code injection attacks. Object Injection/Deserialization: An attack that is extremely popular these days is thoroughly and painstakingly detailed for the students particularly with respect to various Java applications. XML XXE/XPath Injections: In this topic, the ZDResearch Advanced Web Hacking course covers injections related to the XML technology. This includes DOM and SAP parsers and XPath/XXE injections. Reflective/Persistent/DOM XSS: With this skill, students will master all types of XSS. This allows students to have the skills necessary to bypass XSS blacklists and filters. An entirely new universe of different exploits applicable to XSS attacks will be covered as well. CSRF: Here, students will forge requests to create new administrator accounts, gain complete access to the system, and bypass CSRF tokens in addition to other CSRF exploitation techniques. HTML5 Attacks: This topic will encourage students to master HTML5-specific attacks from Video/Audio, CORS, CWM, WebSockets, Canvas/SVG, CSP, and Drag & Drop attacks. Session Management Attacks: This topic will introduce students to session management and it's potential vulnerabilities. This will allow students to accurately understand how attackers may manipulate sessions via session hijacking, session fixation, randomization attacks, etc. Web Service Attacks: This skill provides students with the opportunity to master web service technologies including: REST, SOAP, WSDL, JWT, SAX, SSRF, etc. They will understand how each may be exploited to bypass access control, inject code and leak information which, taken together, results in an application being broken into. Authentication & Authorization: Here, student learning will consist of modern authentication and authorization technologies such as RBAC, oAuth, etc. The topic covers what possible vulnerabilities exist in each of the respective technologies mentioned above. Students will then acquire the skills necessary to exploit these vulnerabilities, bypass CAPTCHAs, gain unauthorized access to systems, and escalate their privileges to root access. Code Auditing: This will provide students the opportunity to understand how code auditing works, how static and dynamic code analysis technologies operate, what SMT and SAT solvers are, what their possible limitations are, how they can be bypassed, and how they can be used to discover new zero-day vulnerabilities within the context of web applications. Other Attacks: Here, students will learn about bypassing WAFs. Attacks such as Open Redirect attacks, Denial of Service attacks, HTTP manipulation attacks, and human API attacks will also be covered in-depth in this chapter. The Method to the Madness: What's the Modus Operandi? All of the topics above are first explained through hands-on, high-resolution (1080p) videos. These instructional videos include demonstrations of attacks and protection strategies. Several assignments (where students practice skills demonstrated in the lecture videos) and practice labs (where students go further and learn the cutting-edge techniques of each skill) are provided for students such that they are confidently able to master each and every topic before moving forward through the course. The labs themselves are engineered to integrate into the training platform. Students are also allowed the flexibility to locally set up the labs on their own machines in order to meddle with them as much as they would like. ZDResearch Training also provides several other cybersecurity training such as Advanced Exploit Development, Win32 Exploit Development, Reverse Engineering, and Malware Analysis, ICS Security and Cyber Forensics.